Easy to draw from, 2-compartment tray, for gin rummy, canasta, and other draw games. Sturdy plastic make. Clear, white, and black Card Trays are available. Easy to draw from, 2-compartment tray with swivel base. Made of sturdy plastic. Available in clear, white or black. Never worry about batteries again! Brand new 2 Deck Luxury Piatnik hand crank manual shuffler. Place the cards and turn the handle to shuffle. Very swift and easy crank... European Quality! 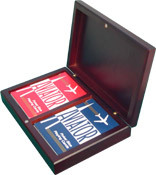 This 2 deck card shuffler is a must for any poker or blackjack player; beginner or pro. 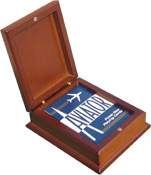 Shuffles 1 or 2 decks, it's easy to use, makes a great gift, and shuffles either bridge or poker size cards. Battery operated. Mixes 2 decks. 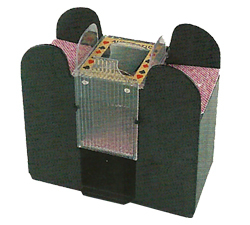 Automatic Card Shuffler for standard size playing cards. Completely shuffles 1-4 decks with easy, push-button operation. Playing Cards and four "AA" batteries are not included. Wood Grain Card Shuffler - NEW! 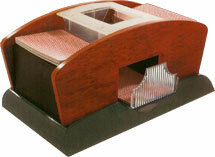 This automatic card shuffler features stylish wooden side panels for a unique look. 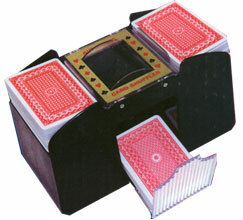 Battery-operated, the shuffler thoroughly mixes two decks of playing cards. Playing Cards and 4 "AA" batteries are not included. 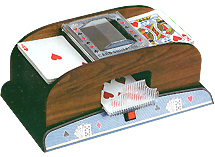 This Six-Deck Automatic Card Shuffler completely shuffles one to six decks of Playing cards with easy, push-button operation. Playing Cards and 4 "C" batteries are not included. 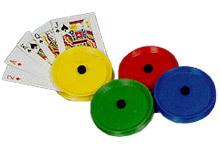 Set of 4 colorful, durable plastic discs. Full-deck capacity. 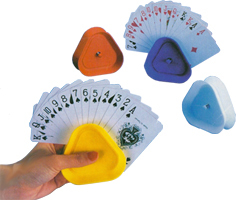 Set of 4, durable plastic triangle shaped card holders. 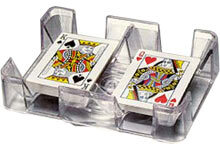 This set of Plastic Playing Card Holders features two black card holders. The holders have a unique king’s crown design molded into the plastic, and they can hold up to 15 playing cards each. Handsome pecan color wood card box with hinged lid. 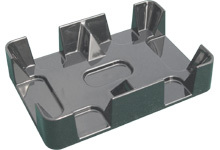 Holds one poker or bridge size deck. Gin Rummy: 5 1/2" x 8 1/2" (50 sheets per pad). Sale Price: $0.93. Was $1.69. Save 45%! 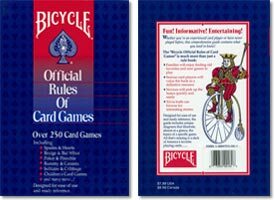 Features rules for over 250 card games. 338 pages. Paperback. This item is temporarily out of stock. For availability please call 1-800-233-0828.